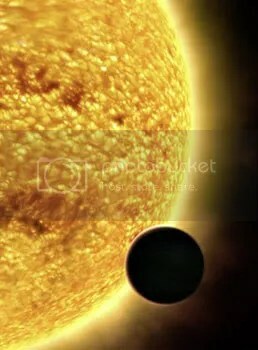 During a planetary transit, light from the parent star shines directly through the atmosphere of an orbiting planet. This means, if you have a precise enough instrument and you look at the right moment, you can actually record a spectrum of an exoplanet’s atmosphere. And that’s pretty cool. The technique’s already been used at least once. Last December, a hot jupiter was found to contain amounts of carbon dioxide in its atmosphere. The method could easily be applied to the search for Earth-like planets. After all, during a transit, Earth’s atmosphere is brilliantly illuminated by scattered sunlight. However, being stuck on the ground, the scientists behind this study have had to be a little more cunning. In essence, they’ve used the Moon as a giant mirror. Light passing through Earth’s atmosphere during a lunar eclipse hits the Moon’s surface and is reflected back at Earth. Ingeniously, this reflected sunlight is then dominated by light that’s already passed through Earth’s atmosphere, giving much the same kind of spectrum an Earth transit would. The result is an optical to near-IR spectrum of Earth’s atmosphere showing the various minor components of the atmosphere. Notably, all of our planet’s major chemical biomarkers (O2, O3, H2O and CH4) show up prominently. While they’re hard to make out in the published spectrum, other (normally hard to see) constituents like N2 can also be seen. In other words, a transmission spectrum from a planetary transit gives a much more detailed view than a reflection spectrum (the only other way to analyse a planet’s atmosphere without actully going there). There’s even a possibility that we might be able to see gasses like NO2 this way. I mention NO2 in particular, because the majority of that in the atmosphere is actually produced by human industry. In other words, there’s evidence for us in Earth’s spectrum. If we were to ever see a spectrum like this one in an exoplanet it would be nothing short of a revelation. With a combination of gasses like those found in our atmosphere, it would be very hard to argue against the presence of some kind of life! This entry was posted in Imported from Livejournal and tagged papers, planets, spectroscopy, stars. Bookmark the permalink.